Our children can so easily turn into junk food monsters. Read up on the importance of moderation in your child's diet and find out about food labels: which ingredients to avoid and which to choose. Then learn about some healthy alternatives that can turn your children into good eaters for life. If you're having a hard time getting your preschooler to eat the good foods instead of the bad, then take a look at Carrots or Chips: Getting Your Preschooler to Eat Healthy. Making sure your children follow a balanced diet starts with you. 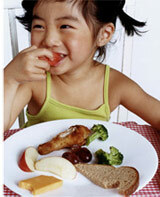 Food Guidelines for Kids will give you a better understanding what your child's diet should be made up of. You'll also get tips on just what the proper food serving size is for your children. Dont' forget to read Nutrition Guidelines so you can be sure your child is getting the right amount of vitamins and minerals. And don't forget to check out Organic Foods: Fact and Fiction to learn just how you and your children can benefit from organic food and products. Many parents are concerned about their child's diet and therefore use vitamin supplements to help their children stay healthy. But are vitamins really necessary or even healthy? Children's Vitamins: Are They Necessary? will help you determine whether or not you should be giving your child supplements.